Deputy “G2” Allen discusses formation and operation of citizens patrol with Highlands group last Thursday at the Highlands Storefront. Information packages, a business security survey and some of the facts learned during decades of law enforcement were shared with attendees. 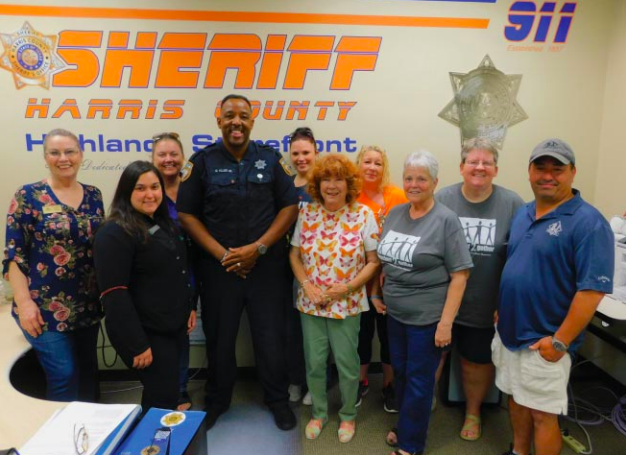 CROSBY – Harris County Sheriff’s Office’s Patrol Deputies of northeast Harris County will meet to address community concerns at the Crosby Community Center May 17 at 7:00 p.m. until 8:00 p.m. The Community Center is located at 409 Hare Road. The meeting is formatted to last just one hour to fit in the many community members that are active in varied concerns. Sheriff Ed Gonzales during the election demonstrated a profound knowledge of the principles of Community Policing. His office established these community meetings to share information and gain ideas beneficial to the community. Last week in Highlands, during their Safety Forum discussion ranged from solving issues that have come up with citizen’s patrols to identifying potentially troubled area and best approaches to getting in contact with the local deputies in other than emergency situations. Information brochures concerning Business security, preventing scams, shredding events, anti-burglary tactics, avoiding robbery and many other topics were made available. Many deputies currently patrolling Crosby may be new to most of the community so it may be a chance to meet your patrol deputy for the first time and the new Captain. Age 0-2 Rodeo Clowns had fine contestants ready to fight the bulls or whatever came from the chute. 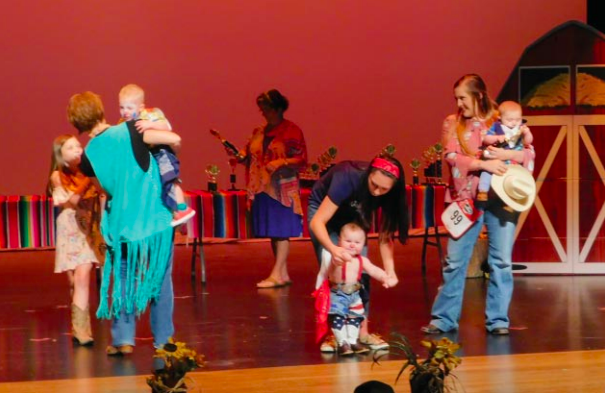 CROSBY – Each year the Crosby Rodeo Pageant reminds us that it is time for the end of the school year and the beginning of the Crosby Fair & Rodeo, this year the first day of the Rodeo Cook-Off is Graduation Day. The pageant this year was last Saturday and many were attracted to the festivities. This year the rodeo starts on June 1 with the Cook-Off Party with a concert by Bag of Donuts. June 2 is Cookoff Wrap Party with a parade at 10:00 that morning and a concert that night by Jason Cassidy the Zane Williams. Wednesday, June 14, is the Livestock Auction. CROSBY – The multitude of questions about what may have effected the progress of the widening of FM 2100 seem answered in that little of what the State indicated at public meetings has been affected. As soon as January of next year the contract on construction of a 4-lane divided highway from .23 miles South of Antelope Drive to South Diamondhead Boulevard is to be let in two phases for an estimated $19,500,000 for each phase. About 1/2 of the PSE has been completed for those jobs to begin. Frequent worries and rumors that the plans had to be changed since the public hearings then are not substantiated. During those hearings, the majority of the public that spoke did not want the highways to be divided highways, rather to make four lanes with a access median running the entire length. This was to enhance access to local property. However, TxDOT engineers insisted for safety reasons that the needed to be divided and have sidewalks.